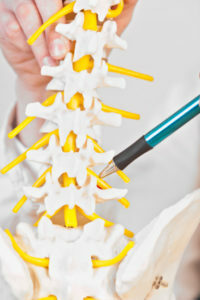 As Chiropractors, we often come across cases being described as “sciatica”. But what exactly is meant by this, and how can Chiropractic help? Here, we aim to discuss the two main causes in the form of disc herniation and joint inflammation, what can be done to ease them and how long it may take to recover from them. The first thing I would like to point out, is “sciatica” is not a diagnosis. It’s like saying you have a headache. That’s great – well, painful, but you know what I mean – but WHY do you have the headache. Giving it a name is not the same as establishing the cause. So at Shifnal Chiropractic you will never be given a diagnosis of “sciatica”. We will always aim to tell you what the cause is – the “why” in this situation. The sciatic nerve is the largest nerve in the body. It runs continuously right from the lower back into the tip of your big toe, branching off at various points to supply other parts of your leg. The term sciatica merely means that for some reason or other this nerve has been irritated or impinged and is now causing you pain and not functioning correctly. But what can cause this? The most commonly suggested cause is a problem with the disc between the joints of the back. Discs are made up of a tough, fibrous outer ring, with a jelly-like inner substance. Sometimes a fault develops in the fibrous outer layer, and this allows the jelly middle to squidge out to form a bulge – think of a jam doughnut! This injury is called a disc bulge if it is quite small, or disc herniation if it becomes larger. A bulge or herniation like this can either occur because trauma has damaged the fibrous layer, or simply through the passage of time causing wear and tear in the fibres. 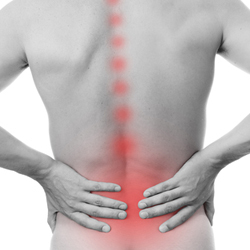 In itself, this condition can be quite painful and can cause significant low back pain. However, the nerves that joint together to form your sciatic nerve emerge from your spine through a small hole at roughly the same level as the disc sits. So if you are unfortunate enough to have the bulge in your disc form right where the nerve is trying to squeeze through this small hole it will cause impingement and irritation of the nerve. This can cause the classic “raging leg pain” that people associate with sciatica, and may also lead to a reduction in the sensation to various areas of the leg, as well as a reduction in the reflexes and a weakening of some of the muscles supplied by that nerve. But disc problems aren’t the only cause of nerve irritation. When a joint has been injured, there is often swelling in the area – if you have ever sprained your ankle, or seen someone who has, then you will be able to recall how it often puffs up like a balloon in response to the injury. You may not be able to see it as clearly in your back, but it’s there all the same. Now, as mentioned before, the nerves supplying your legs emerge from your spine through small holes. Part of the border of these holes is made up of the joint. So if you have a large amount of swelling around the joint, it will easily cause impingement of the nerve in the same way a disc bulge or herniation can, resulting in the same symptoms. Both these causes of sciatica are likely to be treated in very similar ways by your Chiropractor. If it has occurred because of injury to the joint, then the aim will be to facilitate healing in the area, and restoration of the full function in the joint through adjustments and soft tissue work. If the disc is involved, then the aim of treatment will be the same. There is no proven way for Chiropractic to reduce the disc bulge; even so, your body is fairly good at sorting out injuries like this on its own, so as Chiropractors we simply aim to give your body the best chance possible of doing just this. The biggest difference you will want to be aware of regarding these two primary causes of sciatica is the recovery time. If there is a disc bulge or herniation present, then it will take time to get better. How long depends on how good your body is at healing and how severe the herniation– if your body can fix the problem with the disc fairly quickly, then recovery might be relatively quick. If on the other hand the herniation is more severe or your body just isn’t as good at healing itself, it can take a long time to recover from an injury like this. If there has been significant compression of the nerve for that time as well, then it is possible full recovery will never be achieved – we would hope that the pain would be resolved, but it is possible that if a reflex was lost for example, it never comes back to the way it was before. This is purely because nerves are very poor at healing, so if they have been injured past a certain point then they will be unable to recover full function. On a brighter note, if the sciatica has been caused by a joint injury, recovery is much better. Once the swelling has decreased, the nerve should begin to function properly again, and then it is just a matter of encouraging the joint to heal and function properly for a full recovery. One other phenomenon is often commented on during the recovery phase from “sciatica” – the pain moves. This often initially seems to be a bad thing, but if you can bear with me just a little longer, I will try to explain how it’s actually positive. So, let’s say that when you first come to Shifnal Chiropractic Clinic you are experiencing raging leg pain that starts somewhere up in your buttock and goes all the way down into your big toe. No back pain, particularly, but you are being driven crazy by the unrelenting pain all down your leg. 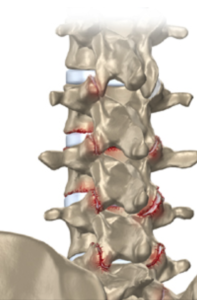 Your Chiropractor tells you that you have an S1 radiculopathy, and explains to you that this means one of the nerves going down your leg is being irritated and impinged by a disc or inflammation around its root. With your agreement, the Chiropractor starts treatment, and over the following treatments you slowly start to notice the pain is lessening in your toe. Then it starts to recede from your lower leg – fantastic! It is now only coming down to your knee. But then, horror of horrors, your back starts to hurt. What the heck is going on?! You didn’t have back pain before…has this Chiropractic treatment caused a new problem?! The quick answer is no! What is happening is the irritation is being decreased on the nerve, but that leaves your body free to recognise there is a problem at the local level of the joint. So it starts to hurt. This is called a localising pattern for the pain. It recedes from the furthest away point and draws in to the original causing area, which may not have hurt to start with. But if it does start to hurt, it means recovery is well on its way, progress is good and once the pain is only in your lower back and has gone from your leg altogether, then we know you are so very close to being completely recovered. So, this is sciatica. It is most commonly caused either by inflammation around a joint which can be quite quick to recover, or by a disc herniation which takes longer. Either way, Chiropractic can almost always help so why not contact us for a free consultation or to book an appointment!